Place bacon in a large frying pan over medium-high heat. Cook until no longer pink, but not crispy, about 8 minutes. Set on paper towels to drain. 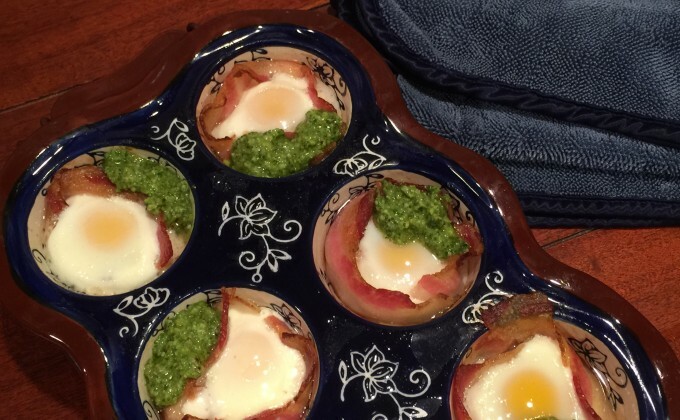 Wrap one piece of bacon around the inside wall of each muffin cup, forming a ring. Crack one egg into the center of each bacon ring. Bake for 7 - 8 minutes or until egg whites are set and yolks are still runny. Serve each one with two teaspoons of pesto. Enjoy!